Red Glasses 2016. 30"x30". Hand-dyed wool on linen. Designed, dyed and hooked by April D. DeConick. Today I finished stretching and mounting my most recent portrait on a canvas-wrapped frame I assembled. It is a self-portrait called "Red Glasses". The finished rug is 30" by 30", so it is quite over-sized. 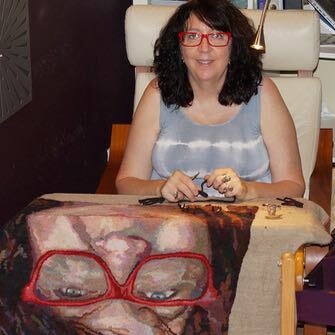 The reason for this project was to develop a series of wool palette packs that can be used to teach portrait rug hooking in the Face Zone course that I am developing. The intent of this rug artistically was to play with muted grayed colors and soft textures that I overdyed in 8 values. I wanted to see if the textured wools make any difference in the overall look of the project. I am still out to lunch on this. Sometimes I like the textures, sometimes not. I really thought there would be more difference in the final look since I incorporated so many different textures in the piece. But honestly, I think the plain wool would have worked just as well. I don't see any overall "great" effect in terms of increasing the volume of textures. My main frustration with this piece was that I started with wool dyed in hues that were too grayed, and frankly, I looked dead. So I had to start adding in red and red-brown tones so that I didn't look so corpse like. This also meant quite a bit of reverse hooking. I probably rehooked the face three times over before I was satisfied with the color. The glasses I rehooked twice. In terms of color, I incorporated 13 colors (8-values each; in plain and textured wool) as follows: 23-Shades of Dusk; 31-Gossamer Gray; 51-Fruited Raisin; 40-Spanish Moss; 10-Norfolk Lavender; 68-Carcoal; 15-Milkweed; 42-Sea Shells; 1-McIntosh Red; 44-Red Oak; 59-Briar Rose; 33-Highland Lilac; 18-Red Birch. Below is the original photo I used as inspiration, and some of pictures of progress. While I am working on the tree headboard abstract, I decided to start a second project because I would like to create a kit for teaching people how I design and hook portraits. The problem is always the wool, which needs to be dyed in values and standardized in terms of colors. So that is why I am working on this particular project. It is a self-portrait head shot. I need to dye a few reds and rehook the glasses because I used scraps and so the glasses feel "off" to me. But you can get the feel for what I am doing. Another larger rug: 30" by 30".